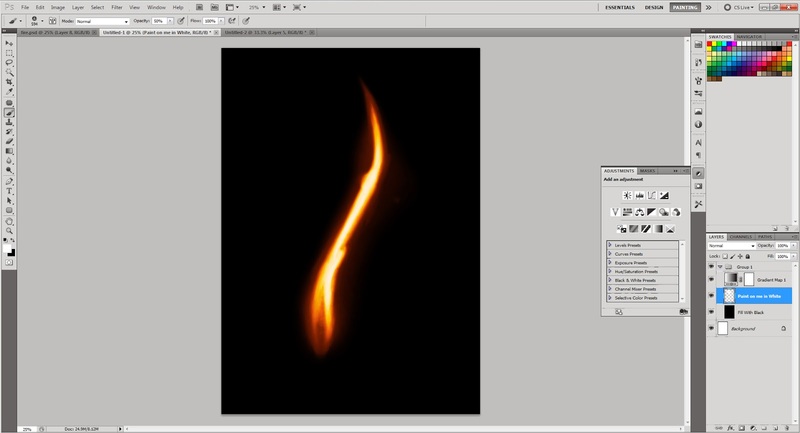 Geoff Ind Animation: Painting Flames, Magic, and other FX using Gradient Maps in Photoshop. 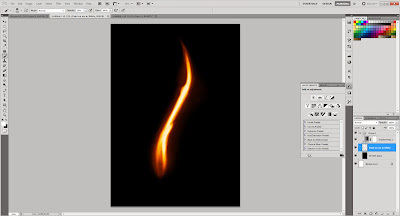 Painting Flames, Magic, and other FX using Gradient Maps in Photoshop. I have been playing round in Photoshop on and off over the last couple of days to sharpen my painting skills and thought I'd share with you a really neat little way of painting glow based FX. Here are a few examples of studies I have painted using this technique. 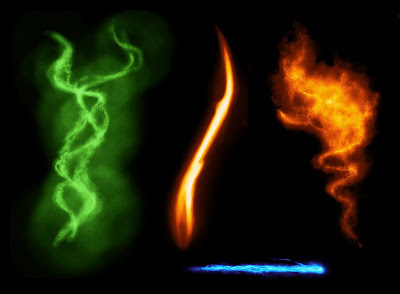 Examples of different FX painted using the same gradient map technique. The actual process to set-up a layer ready to paint using a gradient map is pretty simple and doesn't take more than a couple of minutes once you have completed the step's a few times. 1. Create a new canvas in Photoshop at the size that you want to paint. 2. In the layers window, create a new Group using the group button at the bottom. Create a new Group using the Group button. 3. Adjust the groups "Blend Mode" using the drop down box. The group's blend mode should be set to "Screen". Adjust the blend mode of the group. Set blend mode to "Screen". 4. Add 2 new layers into the group by selecting the group layer and then left mouse clicking on the new layer button twice. The top layer is used to paint your design on, the bottom layer must be filled with solid black. Create two new layers inside of the group. 5. Select the top most layer inside the group, and add an adjustment by clicking on the "New Adjustment" button at the bottom of the window. Select the top most layer inside of the group. click on the "Add new Adjustment" button. 6. A list of adjustments will pop up, select the Gradient Map Option at the bottom of the list. Select the "Gradient Map" option near the bottom of the list. 7. When you select the Gradient Map option, a new layer will be created that has a gradient attached to it. The Adjustments shelf will also have appeared from your list of shelves. Click on the Gradient inside the shelf. This will open the "Gradient Editor". Using the gradient editor you can make new gradients and adjust them. You can also select from the default ones and any that you have made and saved previously. Use the "Gradient Editor" to chose your gradient or to create new custom ones of your own. I have made and saved a few new gradients of my own for Fire and Flames, Smoke and different colours of magic etc. 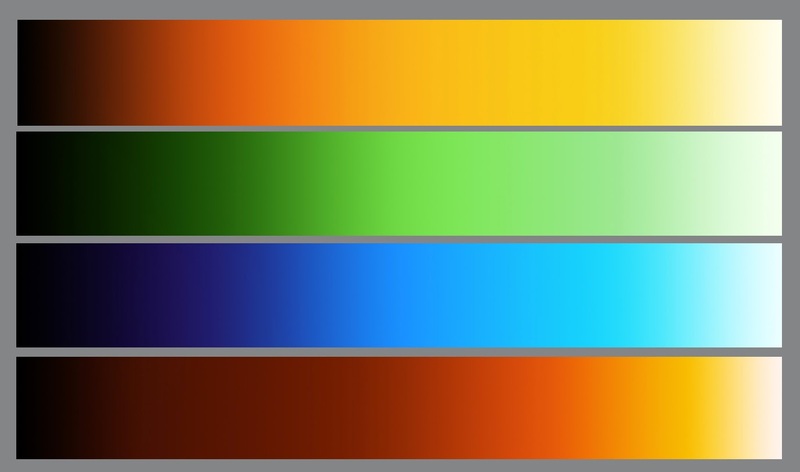 Each Gradient has several different shades that go from Black on the left to a colour with a high value on the right, usually a white or slightly off white colour. I mostly try to have at least 4 or 5 different shades of colour in my gradients to control the types of values of colour I want in my designs and also to add more interest. My custom gradients. From top to bottom. Fire, Green Magic, Blue Magic, and Red Magic or another slightly different version of Fire. Once you are happy with your Gradient, click on the "OK" button at the top of the Gradient Editor. You can come back to your gradient and adjust it at any time while painting by simply selecting the adjustment layer in your layers window and clicking on the gradient to open the Gradient Editor again. 8.Select the centre layer of the Group. Paint your design using WHITE and the brush tool. If you have a Wacom Tablet you can get some really nice overlapping values of colour using the pressure sensitivity of the pen. If you don't have a Wacom then you can also use the opacity options for the brush (at the top of the screen) to get a similar effect using the mouse. Paint on the middle layer in White. I really enjoy using this technique to paint glow based FX. 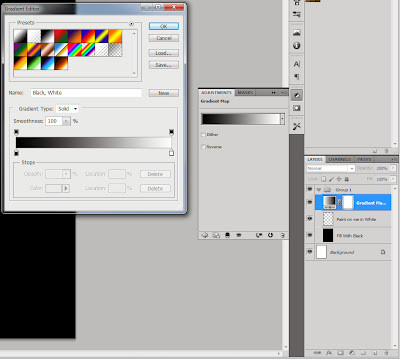 Because you are using just white to paint with, and letting the gradient is taking care of the colour values. (Based on the amount of white that you are putting down on the canvas). It really frees you up to focus on the shapes and design of the effect. Here are the above examples again but in larger versions. 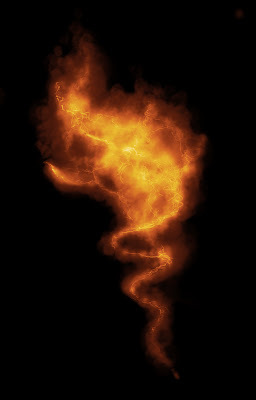 Not much to the design here, the main thing to try and get into the painting is the overall shape of the flame. Asymmetrical shapes work best. When painting magic I try to get layers of interest and detail into the design. Again an asymmetrical design works best for the overall shape. I have tried to incorporate more intricate lightning within the overall design to indicate power within the bolt. 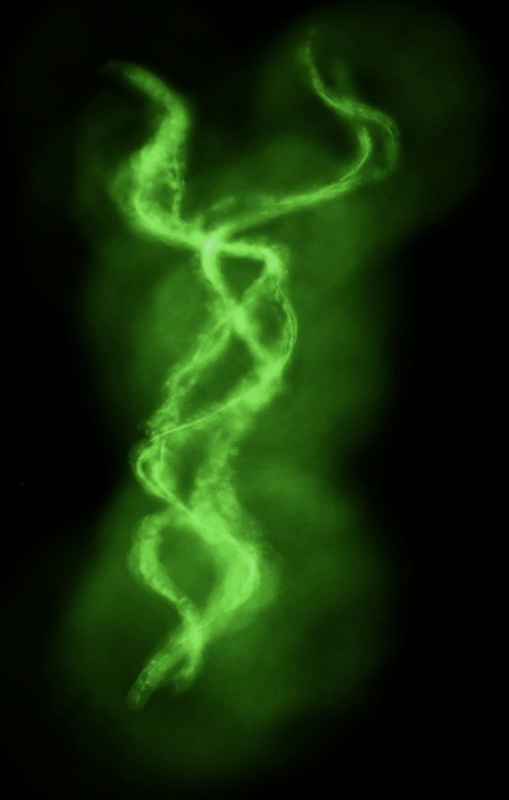 For this example I tried to imagine smoke rising from a cauldron, with tendrils of magical power mixed within. Again this design it all about asymmetry and layers of interest. Of all of the studies on this page this one took the longest and is still in need of more work. I am still pleased with the overall look of the design, again it is asymmetrical and contains more of my layered thinking on the detail. The next evolution to creating these FX based paintings is to combine several of the different coloured gradient maps into the same design for yet more layers of interest. Anyway I hope that you have enjoyed this quick infotainment tutorial! Now go have fun with your own designs! Can you show a video of how to do this? Or maybe post a link?